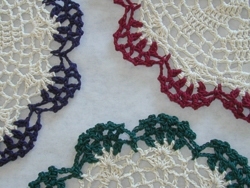 Crochet cotton ecru shade doilies come with a colored border. Available in two color choices. 12" round with sixteen scalloped edge. Crochet doilies make a wonderful complement for displaying your special keeepsakes and curio items. Beautiful and functional, doilies can even be used to accent special gifts or for surface decoration and protection. Note: Dark green is out of stock.